Lexington, Ky. – The top youth reiners in the U.S. went head-to-head on June 28 at the State Fair Arena in Oklahoma City, Okla., to stake their claim on coveted National Titles in the Adequan/USEF Youth Reining National Championship. At the competition held in conjunction with the NRHA Derby, Amanda Hurd claimed top honors in the 14-18 division, while Emmy-Lu Marsh earned the 13 & Under crown. Hurd (Wilmington, Del.) and Mark Hurd’s 11-year-old Quarter Horse gelding Whale of a Whiz cruised to a score of 140.5 to claim the National Title by a half point. Additionally, the horse that served as a reserve for the U.S. Team for the 2010 Alltech FEI World Equestrian Games helped the 18-year-old win the Junior U.S. Team Selection Trial for the Adequan/FEI North American Junior and Young Rider Championships presented by Gotham North. Earning Reserve Championship honors in the 14-18 division was 2012’s National Champion Elizabeth Cosper (Leland, N.C.), who piloted Double Run Farm’s 6-year-old Quarter Horse gelding Oties Tradition to a score of 140. Marsh (Tallulah, La. ), last year’s 13 & Under Reserve Champion, went one better in 2014 to claim her first National Title. 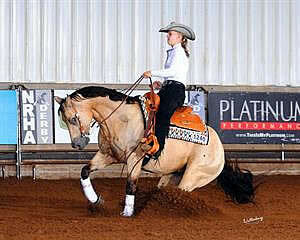 Riding her own seven-year-old Quarter Horse gelding Who Whiz Who, she was awarded a score of 138.5. Finishing three-and-a-half points behind Marsh and earning the Reserve Championship were Mary Elizabeth Sullivan (Winnsboro, La.) and her own 14-year-old Quarter Horse gelding, Freckles Cody Jack, on a score of 135. In the Young Rider U.S. Team Selection Trial for the Adequan/FEI North American Junior and Young Rider Championships presented by Gotham North, Jake Letner (Harris, Mo.) and Larry Letner’s 15-year-old Paint gelding, A Genuine Diamond, proved unbeatable, scoring 138.5. To learn more about the NRHA Derby, visit: http://nrhaderby.com/. Follow the U.S. Reining Team here.